صنعتی, علیرضا, ادریس, حسین, رئیسی, کیوان. (1395). مشخصه یابی ساختاری و بررسی سختی و چسبندگی پوشش فولاد زنگ نزن دانه ریز ایجاد شده به روش رسوب فیزیکی بخار بر زیرلایه فولاد کربنی. نشریه علوم و مهندسی سطح, 12(29), 33-44. علیرضا صنعتی; حسین ادریس; کیوان رئیسی. "مشخصه یابی ساختاری و بررسی سختی و چسبندگی پوشش فولاد زنگ نزن دانه ریز ایجاد شده به روش رسوب فیزیکی بخار بر زیرلایه فولاد کربنی". 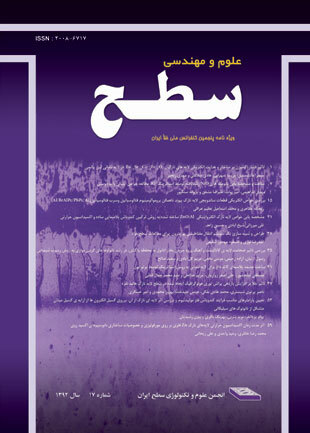 نشریه علوم و مهندسی سطح, 12, 29, 1395, 33-44. صنعتی, علیرضا, ادریس, حسین, رئیسی, کیوان. (1395). 'مشخصه یابی ساختاری و بررسی سختی و چسبندگی پوشش فولاد زنگ نزن دانه ریز ایجاد شده به روش رسوب فیزیکی بخار بر زیرلایه فولاد کربنی', نشریه علوم و مهندسی سطح, 12(29), pp. 33-44. صنعتی, علیرضا, ادریس, حسین, رئیسی, کیوان. مشخصه یابی ساختاری و بررسی سختی و چسبندگی پوشش فولاد زنگ نزن دانه ریز ایجاد شده به روش رسوب فیزیکی بخار بر زیرلایه فولاد کربنی. نشریه علوم و مهندسی سطح, 1395; 12(29): 33-44. هدف از این پژوهش بررسی دو پوشش دانه‌ریز از فولاد زنگ‌نزن AISI 304 ایجاد شده بر زیرلایه فولاد کربنی به دو روش رسوب فیزیکی بخار، یعنی پراکنش مغناطیسی و قوس کاتدی است. پوشش‌ها از نظر ساختار، سختی و چسبندگی با هم مقایسه شده ‌اند. در روش قوس از توان زیاد 3300 وات بر سطح ماده هدف و در روش پراکنشی از گاز آرگون با فشار 105 پاسکال برای تبخیر اتم‌ها استفاده شد. به منظور مقایسه دو پوشش در هر دو روش از دمای زیرلایه 50 ± 300 درجه سانتی‌گراد، ولتاژ بایاس زیرلایه 50 ± 250 ولت و زمان پوشش‌دهی 50 دقیقه استفاده شد. آنالیز XRD و EDS و تصاویر SEM و FE-SEM به‌منظور مشخصه‌ یابی پوشش‌ها و آزمون نانوفرورونده و آزمون فرورونده ویکرز برای بررسی سختی و چسبندگی پوشش‌ها به کار گرفته شدند. نتایج آنالیز EDS نشان داد که اگرچه ترکیب پوشش ایجاد شده به روش پراکنشی بسیار نزدیک به ترکیب ماده هدف بود ولی در سیستم قوس اختلاف ترکیب زیادی با ماده هدف مشاهده شد. آزمون نانوفرورونده نشان داد، با توجه به ساختار نانوبلوری پوشش پراکنشی، سختی این پوشش تا حدود 890 ویکرز افزایش یافت که بسیاربیش‌تر از سختی پوشش قوس (حدود 260 ویکرز) و فولاد زنگ‌نزن 304 (حدود 220 ویکرز) است. با این‌ وجود چسبندگی پوشش پراکنشی به ‌دلیل وجود ترک‌های بیش‌تر در لبه‌ها و هم‌چنین کندگی‌ پوشش، نسبت به پوشش قوس ضعیف‌تر ارزیابی شد. 1. J.M. Guilemany, J. Ferna´ndez, N. Espallargas, P.H. Suegama, A.V. Benedetti, Influence of spraying parameters on the electrochemical behavior of HVOF thermally sprayed stainless steel coatings in 3.4% NaCl, Surface and Coating Technology, 200 (2006) 3064 – 3072. 2. J. Kawakita, T. Fukushima, S. Kuroda, T. Kodama, Corrosion behavior of HVOF sprayed SUS316L stainless steel in seawater, Corrosion Science, 44 (2002) 2561–2581. 3. P.H. Suegama, C.S. Fugivara, A.V. Benedetti, J. Ferna´ndez, J. Delgado, J.M. Guilemany, Electrochemical behavior of thermally sprayed stainless steel coatings in 3.4% NaCl solution, Corrosion Science, 47 (2005) 605–620. 4. X.M. Meng, J.B. Zhang, W. Han, J. Zhao, Y.L. Liang, Influence of annealing treatment on the microstructure and mechanical performance of cold sprayed 304 stainless steel coating, Applied Surface Science, 258 (2011) 700–704. 5. H. Adelkhani, M.R. Arshadi, Properties of Fe–Ni–Cr alloy coatings by using direct and pulse current electrodeposition, Journal of Alloys and Compounds, 476 (2009) 234–237. 6. Ch. Pan, L. Liu, Y. Li, Sh. W, F. Wang, Passive film growth mechanism of nanocrystalline 304 stainless steel prepared by magnetron sputtering and deep rolling techniques, Electrochemica Acta, 56 (2011) 7740– 7748. 7. L. Liu, Y. Li, F. Wang, Influence of nanocrystallization on pitting corrosion behavior of an austenitic stainless steel by stochastic approach and in situ AFM analysis, Electrochemica Acta, 55 (2010) 2430–2436. 8. B.A. Shedden, F.N. Kaul, M. Samandi, B. Window, The role of energetic neutrals in reactive magnetron sputtering of nitrogen-doped austenitic stainless steel coatings, Surface and Coating Technology, 97 (1997) 102–108. 9. D.M. Poirier, P.A. Lindfors, Nonisotropic deposition from a 304 stainless-steel cathodic arc source, Vacuum Science & Technology. A, 9 (1991) 278-280. 10. Z. Iqbal, I. Hussain, A. Rauf, M. Zakaullal, S.T. Hussain, A.u. Haq, Corrosion Protection of Commercial Steel Using Stainless Steel Coatings Deposited by Cathodic Arc Plasma Deposition Technique, Physicochemical Problems of Mineral Processing, 48 (2012) 371–375. 11. W. J. Chou, G.P. Yu, J. H. Huang, Bias effect of ion-plated zirconium nitride film on Si(100), Thin Solid Films, 405 (2002) 162–169. 12. S. B. Abusuilik , K. Inoue, Effects of intermediate surface treatments on corrosion resistance of cathodic arc PVD hard coatings, Surface and Coatings Technology, 237 (2013) 421–428. 13. D. Manova, J. W. Gerlach, S. Mändl, Review: Thin Film Deposition Using Energetic Ions, Materials, 3 (2010) 4109-4141. 14. A. Anders, Approaches to rid cathodic arc plasmas of macro and nanoparticles: a review, Surface and Coatings Technology, 120–121 (1999) 319–330. 15. S. G. Harris, E. D. Doyle, Y. C. Wong, P. R. Munroe, J. M. Cairney, J. M. Long, Reducing the macroparticle content of cathodic arc evaporated TiN coatings, Surface and Coatings Technology, 183 (2004) 283–294. 16. P. Panjan, M. Cekada, M. Panjan, D. Kek-Merl, Growth defects in PVD hard coatings, Vacuum, 84 (2010) 209–214. 17. P. Panjan, D. Kek-Merl, F. Zupanič, M. Čekada, M. Panjan, SEM study of defects in PVD hard coatings using focused ion beam milling, Surface & Coatings Technology, 202 (2008) 2302–2305. 18. P. Panjan, P. Gselman, D. Kek-Merl, M. Čekada, M. Panjana, G. Dražić, T. Bončina, F. Zupanič, Growth defect density in PVD hard coatings prepared by different deposition techniques, Surface & Coatings Technology, 237 (2013) 349–356. 19. Y. Pauleau, P. B. Barna, Protective Coatings and Thin Films: Synthesis, Characterization, and Applications, Kluwer academic publishers, Netherlands, 1996. 20. Donald M.M., Handbook of physical vapor deposition (PVD) processing, Noyes Publications, United State, 1998. ویرایش دوم، انتشارات ارکان دانش، اصفهان، 1388 . 22. A. Anders, Approaches to rid cathodic arc plasmas of macro and nanoparticles: a review, Surface & Coatings Technology, 120–121 (1999) 319–330. 23. A. Anders, A structure zone diagram including plasma-based deposition and ion etching, Thin Solid Films, 518 (2010) 4087–4090. 24. C.M. Fernandes, V.M. Ferreira, A.M.R. Senosa, M.T. Vieira, Stainless steel coatings sputter-deposited on tungsten carbide powder particles, Surface & Coatings Technology, 176 (2003) 103–108. 25. S.R. Kappaganthu, Y. Sun, Studies of structure and morphology of sputter-deposited stainless steel–nitrogen films, Applied Physics A, 81 (2005) 737–744. 26. J.-P. Eymery, N. Merakeb, Ph. Goudeau, A. Fnidiki, B. Bouzabata, A Mossbauer comparative study of the local environment in metastable 304 stainless steel films depending on the preparation mode Magnetism and Magnetic Materials, 256 (2003) 227–236 27. R. L. Boxman, Handbook of Vacuum Arc Science & Technology: Fundamentals and Applications, Noyes Publications, 1996. 28. J. Richter, Application of Vickers indentation for assessment of PVD TiN coated new nonledeburitic high-speed steels, Surface and Coatings Technology, 162 (2003) 119–130. فولاد، چاپ دوم، انتشارات ارکان دانش، 1392 . 31. M.A. Meyers, A. Mishra, D.J. Benson, Mechanical properties of nanocrystalline materials, Progress in Materials Science, 51 (2006) 427–556. 32. R. Liu, D.Y. Li, Y.S. Xie, R. Llewellyn, H.M. Hawthorne, Indentation behavior of pseudoelastic TiNi alloy, Scripta Materialia, 41 (1999) 691–696. 33. M.M. Lima, C. Godoy, J.C. Avelar-Batista, P.J. Modenesi, Toughness evaluation of HVOF WC-/Co coatings using non-linear regression analysis, Materials Science and Engineering A, 357 (2003) 337-/345. 34. I. A. Ovid’ko, A. G. Sheinerman, Mechanisms of Fracture Toughness Enhancement in Nanocrystalline Solids, Proceedings of the World Congress on Engineering, London, 2012.